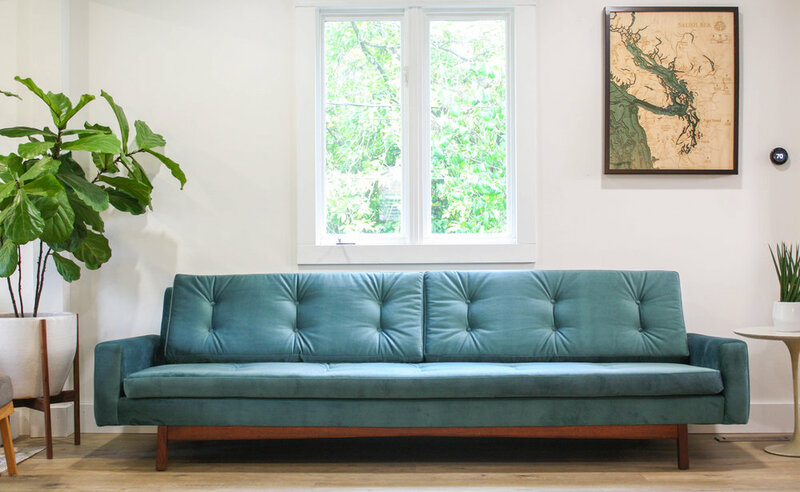 This incredible mid century modern sofa can't be beat. Long and lean. Perfectly proportioned and sure to be the statement piece of your home. Although this sofa is long (nearly 9ft) the light, floating effect, keeps the piece from feeling bulky. Appears to be in the manner of Adrian Pearsall for Craft Associates and Kroehler sofas from the era. Solid walnut sculpted wood stretcher connects to four solid walnut legs. Check out the coloring and grain on some of the close ups! Brand new straps, foam, and batting wrapped in the most delicious Jade velvet/mohair. 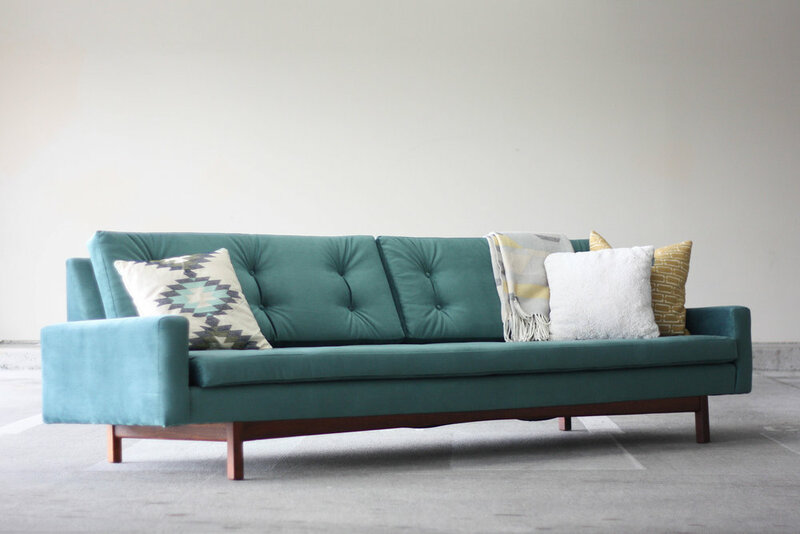 It is buttery smooth and the softest sofa you'll ever come across. That's not an exaggeration. And since there are no loops to the fabric, it will be much more kid and pet friendly. Liquids will bead up as opposed to immediately absorb like on a wool. All cushions are zippered, flippable, and removable (in case you wanted to add a few of your own pillows to spice things up). The long cushion has a clip system on the edges to keep the cushion from curling up when someone sits in the center. The back cushions were not originally part of the sofa, but we felt like having some made provided nice dimension and flexibility for potential buyers. Not much else to say. Check out the photos and let us know if you have any questions.